Here is what irks me: the painting only works within the context of a bunch of fairly esoteric and inside-baseball talk. The picture, itself, represents nothing. It means nothing. It is, more or less, nothing. Not in some pseudoprofound “Zero, for some reason, turned out be a square” nonsense, but in the mundane, “not much to see here” sense. And that is what I fundamentally don’t like about modern art. Or about professional philosophers. They are elitist to the point of nihilism. They are belligerent and arrogant in their intentional impenetrability. They are fundamentally hostile to the everyman. And, quite frankly, ain’t nobody got time for that. Give me art, any day of the week, that is actually trying to communicate something to me as I am. Not that is intentionally whispering to only a chosen, select few. Even if I can hear, I have no interest in being part of that anti-humane snobbery. US Military Leadership: Treasonous or just Corrupt and Incompetent? Nathaniel, I have some questions for you (not expecting answers), as well as comments about your post. Why is “feeling” the standard by which you judge visual art? That is rather vague. Why not symbolism or narrative (which in traditional art make far more sense)? Why did you pick an old, rusty Malevich painting as your example when there are far more “offending” pieces to choose from. Why pick an example from modern art when we are now living through the post-modern period, with its own characteristic examples of elite art forms? You describe your reaction to the piece. It would be far more interesting to include an explanation of why the piece and its supporting quote exist. Ideas have consequences, and there are ideas and assumptions behind both the painting and the quote that need to be revealed and challenged. Jacques Barzun is outstanding when it comes to ferreting out the often hidden notions behind works of art we hold up as culturally significant. This view seems to require the belief that art and philosophy don’t really matter. It would be absurd to make the same claim about the natural sciences, for example–sure, only a select few have the training to understand cutting-edge research in genetics, but that’s okay, because the complexities it deals with are real and important. You can write popular books on genetics, and they play a valuable role, but it’s a different role from the scientific writing for audiences of scientists. With art and philosophy, you can’t think that. You have to think that the philosophy written and art made for non-experts fills just the same role as what’s for the elites, otherwise the arrogance claim collapses. I am less familiar with art than philosophy, but I think that’s an error. Popular works of philosophy generally take insights from philosophy written for philosophers and distill them into forms digestible by educated layfolk. Professional philosophy is where those ideas get hashed out far more quickly and precisely than they could be if they were written without jargon. There’s some deliberate obscurity in philosophy, but it’s pretty rare in my experience–most of the obscurity serves a purpose and isn’t obscure to professional philosophers in the intended audience. As an outsider to the art world, I don’t even know how I could know that what is obscure to me plays no valuable role for other artists which is necessary for keeping popular art innovative. Why is “feeling” the standard by which you judge visual art? That is rather vague. Why not symbolism or narrative (which in traditional art make far more sense)? Don’t get overly hung up on “the standard by which [I] judge visual art.” That’s not the point of my brief post. The point isn’t what the standard is but rather who the audience is. I do not dislike this kind of art because it is unfeeling but because it is elitist to the point of misanthropy. Why did you pick an old, rusty Malevich painting as your example when there are far more “offending” pieces to choose from. Because it was featured in a recent article in The New Yorker that was–not coincidentally–shared on Facebook by a professional philosopher. And also because the article was such a ripe target. It’s description of the significance of the piece was unintentional parody that I simply couldn’t let go without comment. Why pick an example from modern art when we are now living through the post-modern period, with its own characteristic examples of elite art forms? You describe your reaction to the piece. It would be far more interesting to include an explanation of why the piece and its supporting quote exist. For my part, the idea that the primary method of involvement with art has become one of “interest” (i.e. one of formal, sytlized intellectualism) is itself the problem. The idea that our first resort in evaluating art should be a formal academic treatment (I’m reading between the lines a little bit on that) to explain what is in no way self-evidence is, for me, exactly the problem. Lots of art is just subjective taste. I have broad musical taste, but I don’t really get opera. Or jazz. I write that off as personal preference, however, and honestly as something that I’d like to revisit when I have time. I’ve learned that a lot of things that seem foreign as an incidental matter (i.e. I just wasn’t exposed to a lot of opera growing up, so I don’t have any access to what is going on) can become enjoyable with a little effort. Or maybe I’ll never really like it at all, because of taste. Could be, but I certainly won’t have any animus towards opera or jazz. But for me there’s a very important difference between “I don’t understand this because of random happenstance” and “This work of art is engineered to be opaque.” My dislike of the second is, I think, not reducible to mere taste. It is, as I said, a kind of elitist, anti-humane approach to art that I find morally as well as aesthetically repugnant. This view seems to require the belief that art and philosophy don’t really matter. If you’re attributing that viewpoint to me, then I must disagree most strenuously! I dislike contemporary philosophy and art because I think art and philosophy matter. To the extent that what we have today is a sterile, anti-humane trinket as opposed to something real and visceral and humane, it’s a problem precisely because of the important role art and philosophy ought to play in our lives. Carry out the analogy to other domains in which there is arcane communication between experts. Really good popular writing about the natural sciences may well inspire us, but no one thinks that’s the sole point of doing science. We instead expect that the experts are actually discovering real things about the actual world–things which matter independent of how they make us feel. If physics was of no intrinsic value, we might have the same objections to physics journals you have of philosophy journals or the rarefied art world. But we think physics is actually about something, and it’s a hard thing which we need lots of math and specialized concepts to talk about. If art and philosophy should appeal to a wide audience or be arrogant and nihilistic, it has to be the case that the same isn’t true of them. These experts-only works must not be accomplishing anything, or their obscurity would be justified by those accomplishments. When I read John Locke, I find the experience hideous. His very sentence structure seems designed to make his readers put down his works. But the development of his ideas, even if they make me feel excluded, substantially contributed to our constitution. Could we have had Pixar’s Inside Out with The Square? I don’t know. Maybe art genuinely is a domain which is purely superficial. But philosophy certainly isn’t. The ideas of Rawls would be no less valuable if they had originated in an arcane journal article before becoming popularized. Carry out the analogy to other domains in which there is arcane communication between experts. I think that doesn’t work for two reasons. First: intent. A physics professor going on about quantum chromodynamics does not have as his objective shutting out non-experts from the conversation. It’s just that quantum mechanics is really, really weird (and very complex) and so you inevitably get “arcane” terminology. That’s fine. When the terminology is arcane due to necessity and with the objective of just trying to communicate at all that is one thing. But in the case of art the obfuscation exists not out of necessity and not to further communication (which just happens to be very complex), but intentionally. Arcane terminology is, for lack of a word, a bug in physics discourse. It’s a feature of modern / post modern art, where it is neither nor necessary nor unintented. Second: legitimacy. There are actually some real concepts underlying technical terminology in, say, statistics. “Heteroskedasticity” is not just alphabet-soup. It’s referring to an actual problem with actual data that people have a need to talk about. But the opaqueness of modern philosophy is–in my mind–almost entirely a defect of perverse incentives. We have basically the same model of scholarship for studying sub-atomic particles as for studying Socrates. And that’s a problem. Because in physics or engineering the need for novelty (your research must be new) has outlets in actual creativity: new concepts, new theories, new techniques. But in philosophy, it often doesn’t have such an outlet. There is a limit, in my mind, to how many people can be profound about Plato’s Republic all at the same time while all saying something materially different. The need to be distinctive + lack of new material = highly convoluted discourse as a camoflauge for the fact that you’re not actually saying anything at all. Thus: the Sokal Affair. In short: there are real, systemic problems with modern intellectual life that can’t be papered over or excused by saying “Well, experts have to use arcane terminology.” Sometimes, they do. Other times, the arcaness of the terminology is not justified at all and is in fact covering up some serious problems. Perhaps I should explain where I’m coming from. I studied postgraduate philosophy for six years, and I don’t recognize that characterization at all. The most nonsensical areas of philosophy I recall weren’t history, but philosophy in the continental tradition. Philosophy of mind, for example, has been struggling to keep up with new results which have pushed the development of new concepts, theories, and techniques. Logic, ethics (especially various applied ethics subfields), philosophy of science–even metaphysics and epistemology were all developing fast and never struck me as deliberately obscure. The mere fact that the history of philosophy has so many massive names from the past few hundred years suggests that it hasn’t simply been reduced to spinning its wheels on Aristotle for two millennia. So, I certainly understand how deliberate obscurity would cause the loss of trust you describe, but I’m interested in what your experiences which led you to perceive it have been. You seem like a fairly philosophically sophisticated thinker, so I imagine there have been some, but they’re so at odds with my own that I’m baffled. I think it’s possible that there is a sort of elitism by people who write about art, such as the author of the New Yorker piece, or professional music critics in the vein of Pitchfork, or even sports journalists who might name drop some obscure player in a bygone era in effort to present their credibility to their peers. But no matter how elitist a critic may seem when writing about a piece of art or music, I don’t believe that the artist is creating something in an effort to be elitist. Malevich became famous, and with fame came his ability to talk about himself as if he were some great genius, but I have a feeling that had he never gained this type of fame, there would be a warehouse somewhere with hundreds of canvases all painted with solid color squares because this is what he felt was important to him, and what moved him. This isn’t just to knock critics, though. Professional criticism is still very important, and is often a great avenue to discovering unique and interesting things that you may not have heard of through general mainstream avenues. Year-end best-of lists for movies are a great example of this, filled with foreign, indy and hard-to-find films that can be incredibly moving. This reminds me of a scene from Vonnegut’s Breakfast of Champions where the character Rabo Karabekian loses his temper after being constantly criticized for selling a modern painting to the town for the modest sum of $50,000. ‘The painting did not exist until I made it,’ Karabekian went on. ‘Now that it does exist, nothing would make me happier than to have it reproduced again and again, and vastly improved upon, by all the five-year-olds in town. I would love for your children to find pleasantly and playfully what it took me many angry years to find. The Malevich painting isn’t really pivotal, but someone with a microphone says that it is, and we are supposed to believe it. There is evidence of a trajectory going back to the late medieval period, but the works we identify as pivotal are merely clear expressions of prevailing notions that form the trajectory. I don’t think the works themselves cause something to pivot—they are physical confirmations that the pivot has already occurred. I share your dislike of the elitism that is fundamentally hostile to Everyman, but as an art professor I find Everyman becoming fundamentally hostile to anything that isn’t immediately accessible to his shrinking frame of reference. Everyman can no longer tell whether he is the victim of deliberate impenetrability or the beneficiary of nourishing visual expression. Dallas, while it is hard to discern a person’s motivations, it seems clear that certain artists– Warhol, Dali, Koons, for example–are primarily motivated by the desire for fame. Their work usually proclaims this motive. 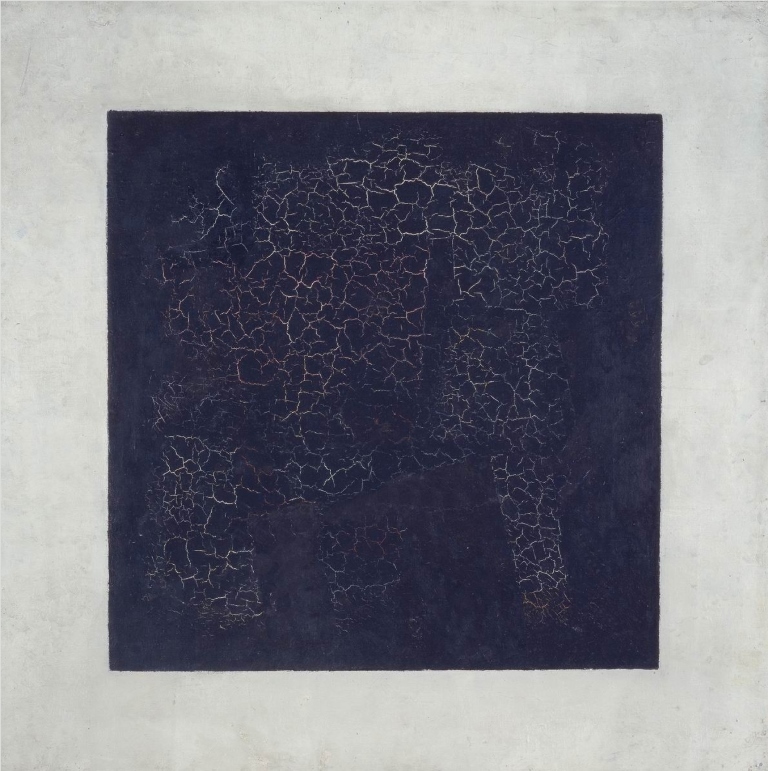 I don’t know what Malevich intended, but he certainly intuited his part in an artistic trajectory that deliberately dismissed Everyman. My background in philosophy is that I was originally a philosophy major as an undergrad. I changed my major very late–after I’d done quite a lot of philosophy coursework–in large part because of how much I disliked modern philosophy. There are a couple of clear thinkers out there who seem to be writing intelligibly (Nagel is one, for example) but increasingly it seemed to me to be much more about showmanship and looking clever than saying anything substantial. I was very, very turned off by that, to the extent that I ditched the major. I went with math instead, which seemed like basically the polar opposite of the self-serving, vacuous cleverness of contemporary philosophy. The first is kind of interesting, but not really innovative. The second seems primarily one of those provocative things people say for the sake of getting attention. It’s totally unworkable as a policy because there’s no objective measurement of “informed,” and so any attempt to get less-informed people to vote leads to instability. The more people follow this advise (and do not vote), the easier bloc voting becomes, making the entire system prone to takeover by narrow but coordinated interests. I asked him about this, and he had no reply at all. So what’s the point? It’s practically useless and seems patently inferior to the suggestion that, I don’t know, people ought to spend more time than they do informing themselves before they vote. But you can’t build a reputation as an academic without some controversy, so strictly from that viewpoint of course it’s a smart argument to make. But no matter how elitist a critic may seem when writing about a piece of art or music, I don’t believe that the artist is creating something in an effort to be elitist. Well, you’re a lot less cynical than I am. From my experiences with artists and academics, intentionally elitism seems like par for the course. I mean come on, even hipster music fans have to disavow any band that becomes too mainstream. It seems entirely naturally for college-educated art grads to studiously avoid anything that smacks of low-brow populism in favor of appealing to right crowd. I’m not familiar with Brennan’s work, but that strikes me as a criticism of it which reads your goals onto it. One of the prevailing dogmas of democracy is that participation of the citizenry in government is an unqualified good. Getting a realistic conversation started about the limits of that could certainly be of practical value, but first you have to break the taboo against questioning it at all. The project of selecting policies can’t even reasonably begin until lots of folks have worked on hashing out the limits of voter participation, and that won’t happen unless people see it as a promising area of research. When you’re trying to get a dialogue started about some issue, it’s perfectly sensible to focus on the unintuitive possible results. If you’re going to work for a year and come out believing nothing you didn’t already know, it doesn’t hold out much hope of discovery. But there’s no benefit to making that call for attention impenetrable–just the opposite. Layfolk would be expected to dismiss it at this stage, but that doesn’t mean it isn’t intended to positively affect their lives, once that conversation has progressed to the point where it can result in some policy options. So, on the one hand, I fear your perspective on modern philosophy may be un generous to the point of misinterpretation. On the other, it seems to me there are lots of occupants of the middle ground between Jersey Shore and The Square, both in art and philosophy. The plea for it seems like a denial of this. I’m not sure how to resolve it–you concede there are some examples, and I’ve no access to aggregate data, so at best I could extend your set of exceptions. Literature seems like a marvelous case, though–my neighbor recently had a small book published, and there were apparently quite a number of “literary” publishers who aimed to release lesser-known volumes whch would be less accessible to the general public but still sell moderately well. Perhaps you’re thinking of the non-literary arts, though. From my perspective, academia in general is suspect. It’s not that I think scholars are in aggregate any less moral than any other human, it’s just that people respond to incentives and the incentives of academia are particularly perverse in the humanities. In the sciences, there is genuinely new knowledge to find. It might be hyperspecialized to the point of near-nihilism, and that is a problem, but there is at least the possibility of some new theorem, some new method, some new procedure that is empirically verifiable, and that necessity of verification and replication keeps a measure of honesty and groundedness. But by the time you get to literature and philosophy you’re pretty much at the bottom of the dregs. Philosophy is particularly noxious to me because of my firm conviction that a great deal of what is said by philosophers (again, based in particular on attending various lectures and speeches) is essentially meaningless, groundless, and pointless. Harsh? Sure. But I point you, once again, to the Sokal Affair. The humanities may have been humiliated by this experience, but apparently neither truly humbled nor truly educated. There are individual scholars I admire deeply (including my own father) who work in these fields. They are, in my mind, notable primarily as exceptions that prove the rule. That’s what I meant originally when I wrote that I thought your view entailed that philosophy and art don’t really matter. You think there isn’t genuinely new knowledge in these domains. If there’s no reality to track with your concepts, the only force driving them is their utility, and more easily-understood concepts would be of broader usefulness. So perhaps new philosophical work matters if it’s useful, but it never matters intrinsically–we wouldn’t expect it to add anything true. If that interpretation of your view is right, the exceptions to your rule are doing work which clarifies the application of existing knowledge to the modern world and modern concepts in an accessible way. Is that accurate, or do you think that there are people discovering genuinely new truths, but that they’re rare? So, I think you’re conflating things that are very different here. The point of scientific progress is not that there’s an objective reality out there, but that it is easily and publicly verifiable. This verifiability makes it amenable to communal endeavors and forward progress. Philosophical and artistic pursuits do not lack the objective reality, but rather the quantifiability / verifiability. Simply example: you can chart a very clear progress in physics from Aristotle to Newton to Einstein. Questions get answered. Not all of them, of course, but a lot of them do. Meanwhile, in philosophy, the free will debate has not changed after literally thousands of years. No progress. Even this is–by itself–not necessarily a problem. In the first case, it’s not a criticism of philosophy. It’s the definition of philosophy. Back in the day, a philosopher studied math, biology, and ethics (as an example). But as some of those fields proved amenable to objective methodologies, they eventually got stripped out and went their own way. Physics is physics (and not philosophy) because it is soluble. So increasingly, philosophers are left with exclusively the insoluble. Again: not a problem. Sometimes wrestling with the questions is as important–or more important–than the answers. There are different kinds of knowledge, different ways of knowing, different ways of learning. The problem is that mismatch between the kinds of knowledge in philosophy and the constraints of contemporary academia. It’s publish or perish. There is thus an absolute requirement for novelty. This isn’t a bad thing when you’re working with the kind of knowledge that is amenable to accretion. One scientist builds on top of the work of another or tears it down, and it happens in a realm where the results are (for the most part) all objectively verifiable. So the need for novelty can be pushed into channels that are basically functional. But now imagine that drive for novelty colliding with a problem like free will. The need for novelty is just as strong, but the capacity to evaluate new contributions objectively is basically absent. As a result, dysfunction results. Scholars can hardly do anything else but wrap flimsy, silly, or vacuous ideas in increasingly sophisticated rhetoric to appear to have something novel when really they do not. In the hard or social sciences this happens too, but it involves fabricating data and there is a possibility of getting caught and very high penalties if you do. But in the humanities fabrication can never be conclusively proved and–what’s more–it’s pretty much what everyone is doing anyway. And once you get that ball rolling, it just gets worse and worse. So, nowadays, the humanities is basically junk and politics. The name of the game isn’t to contribute, it’s obfuscate the lack of contribution. The fundamental problem isn’t ontological, but epistemic. Without any objective access to answers to questions like free will and in the context of a need to say something novel, the inevitable result is an arms race of weaponized pseudo-babble. This would all be rather hilarious if it weren’t for the fact that I do care about art and philosophy. I care about them very deeply. And so to watch this happen to them is quite distressing. I can’t believe it. Not one reference to Calvin and Hobbes on possibly Bill Watterson’s favorite punching bag :P. Circa 1985-1995 for the record! As far as an actual comment, I’m continually struck by how easy it is for me as an amateur to read Thomas Aquinas compared to any other philosopher besides maybe Plato. I bet Aristotle would land in a similar category if his works were actually his works and not collected lecture notes. Granted, writers like Thomas Aquinas and Plato have the advantage of needing to be translated (and thus getting continually updated in current English), but c’mon, there’s some really obscenely unreadable passages in English from writers who aren’t even a couple centuries old or possibly not even dead yet. Overall, I want to improve my knowledge of more recent philosophy as part of being more well rounded and fair, but I am unabashedly biased against the late 19th and 20th century, both for technical reasons Nathaniel has listed and my general moral aversion to what 20th century philosophy gave us. Life is short, reading time is shorter, and I don’t want to spend it reading garbage for the sake of fairness. On a random note, it also still makes me chuckle that Antony Flew reportedly converted to deism because, among other reasons, he read Aristotle’s actual words (rather than secondary summations by other 20th century philosophers) later in his life. 10 points for Antiquity House. But I’d say take all my thoughts with a grain of salt. Again, I’m thoroughly biased against recent philosophy and very fond of the strains of thought running through Aristotle/Augustine/Thomas Aquinas. I actually also really enjoy Hume, not because I agree with many of his ideas, but because he seems to be the most thoroughly consistent and honest skeptic I can read. Carmina Burana was finished in 1936, by the way, so I’m not just fetishizing old stuff.